Create your own important laminated signs conveniently without the need of an expensive lamination machine. Self-adhesive sheets with easy peel backing that includes a grid to help size and align documents. Create professional-looking signage instead of pasting sheets of paper to walls with tape. Create your own important laminated signs conveniently without the need of an expensive lamination machine. 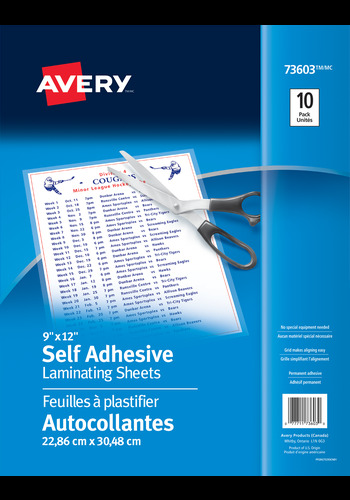 Avery® Self-Adhesive Laminating Sheets are quick to make and easy to use. Simply use the included grid to size the document, place the document on the adhesive side of one sheet, lay the second sheet adhesive side down to seal the other side of the document and trim the edge. Create professional-looking signage instead of pasting sheets of paper to walls with tape. Create and design your own beautifully laminated, professional-looking documents that will stand the test of time.